This quilt story is a long one. But it’s so dear to my heart, I hope that you will grab a cup of coffee, settle in, and indulge me in the telling. 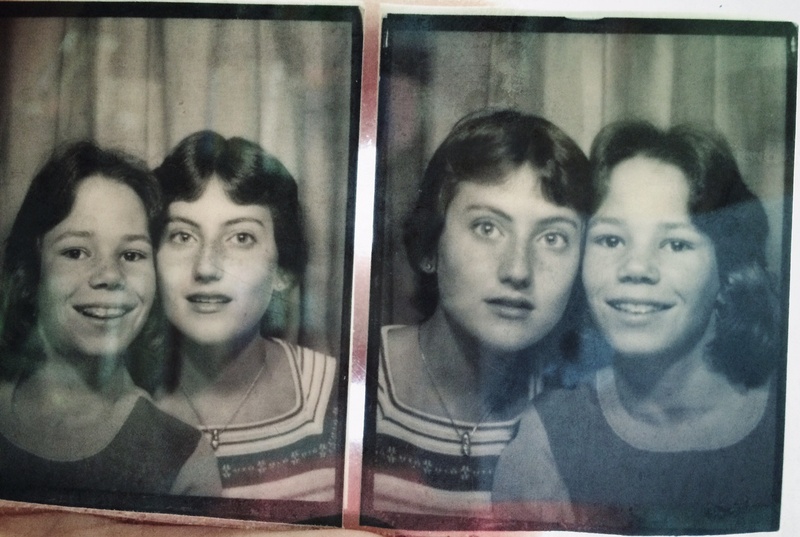 I’ve written before about my oldest and closest friends — the Js. Joan-Marie, Jami, Janet, Johnna and Julie all grew up together. Four of the Js have known each other since Kindergarten. I joined the tribe in 5th grade when my mother moved us from Tulsa to “Mayberry,” the loveliest hometown ever. Three of the Js still live in or near Mayberry (as I did until three years ago) and we remain fast friends to this day. Today’s story begins with my friend, Janet. Here we are, circa 1976, preparing for an appearance in Mayberry’s Pioneer Days Parade. 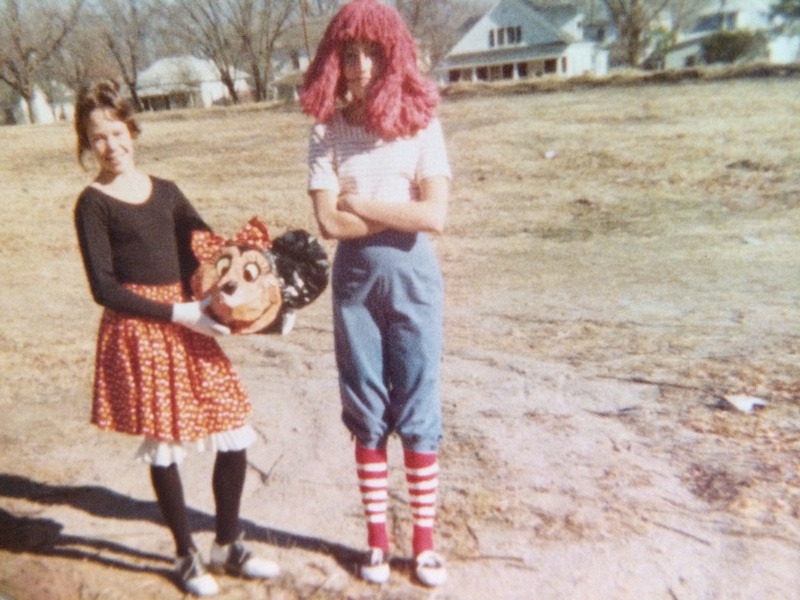 Janet and Boney Joanie enjoyed their stint as Minnie Mouse and Raggedy Andy so much, we parlayed the experience into a four-year stint as “Spuddy and Spry” in our high school’s clown troupe. We shared a love of acrobatics and performance and we spent untold hours in her yard and mine perfecting our tricks and tumbling routines. At one point, we both learned to juggle and Janet learned to ride a unicycle in pursuit of a more entertaining performance. Janet was petite and remarkably strong and athletic. I have vivid memories of her standing on her head and pushing up into a handstand, which she could hold on balance as long as she desired. I was far too tall and skinny to have much athletic potential, but I could contort myself into all kinds of shapes and I was a fearless and loyal companion of the girl I idolized. 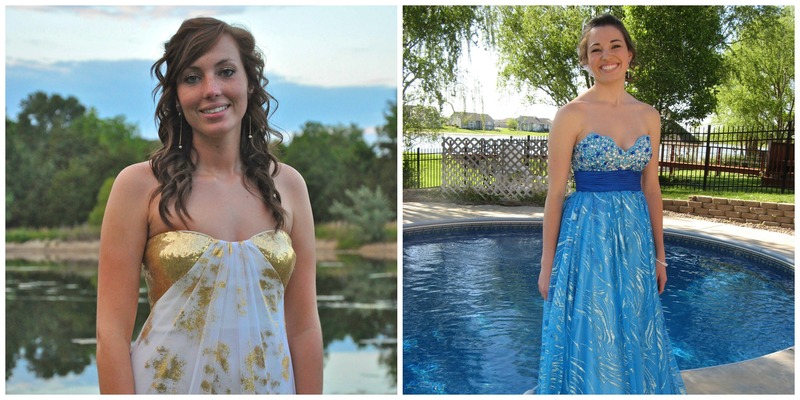 We were inseparable for years and I can’t count the number of sleepovers we shared. At her house, we listened to Barry Manilow until the wee hours then wedged ourselves into her twin-sized bed where we slept like interlocked Lego pieces. At my house, we begged my mother to make us SOS (a hamburger and white gravy concoction we loved) and watched television on the tiny black-and-white set in my bedroom. Years later, Janet and I would also “share” pregnancies. Her first child, Sarah, was born on Dec. 8, 1992, and my CupKate was born exactly three months later on March 8, 1993. Janet and her husband were living in Texas at the time and both her mother, Carolyn, and I couldn’t wait to see baby Sarah. So Mr. Mom, Carolyn, and I loaded up in our 1967 Plymouth Belevedere and made the trip to Ft. Worth as soon as she was born. I was six months pregnant, uncomfortable, emotional, and unsure what to expect. I’ll never forget baby Sarah’s non-stop wails and what seemed like incessant breast-feeding sessions. Janet and her mother seemed unperturbed by the noisy soul demanding all the attention in the household, but I was suffering from pregnancy exhaustion and I was more than a little unsure how well suited I would be for infant care. Like Janet and me, Sarah and Kate have been friends forever. 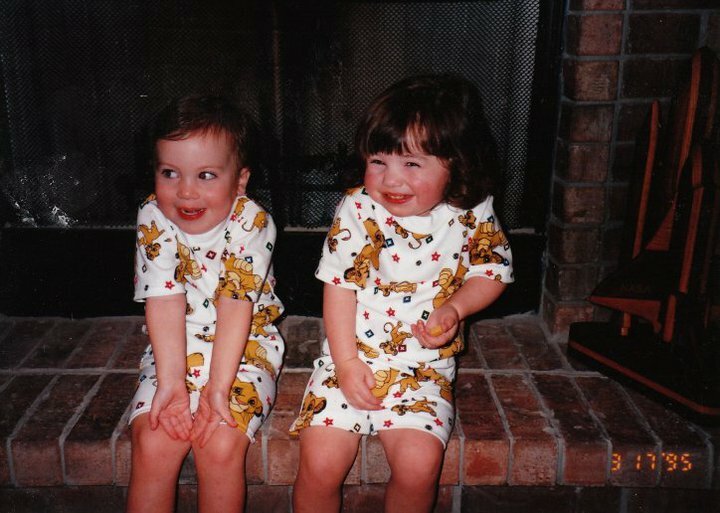 This is one of my favorite photos of our girls at age two. While Kate was quiet and reserved, Sarah was a tempestuous swirl of energy and passion. In their youth, they were a feminine yin and yang not unlike Spuddy and Spry. It doesn’t seem possible these adorable babies are turning 21. Or that these beautiful, sweet, and mature girls are ours. Sarah is like a second daughter to me or, more to the point, the kind of daughter you would select for yourself if there was choice involved in these kinds of things. She’s smart, thoughtful, passionate, loyal and, despite her boisterous beginnings, sweetly considerate, focused, and determined. So when Janet texted me on Halloween to ask if she might commission a quilt for Sarah’s 21st birthday, I couldn’t say no. I was flustered I had so little time, and chagrined I didn’t think of it myself much earlier, but I sprang into action. Turns out, Sarah is studying abroad in Malawi next month, so Janet suggested I create an “African themed” quilt. I had no idea what that meant but, together, Janet and I decided it meant bright (an array of Batik prints seemed perfect), simple (large panels of fabric with a bit of patchwork and sashing), and personalized (with Sarah’s name, trip dates, and an appliqued African dancer). Janet texted me yesterday to share this photo. I can’t see Sarah’s hands, but I’m going to take this as two thumbs up. « Packages near and far. The quilt is perfect. My, she looks like Janet. A beautiful life story. I hope she has the quilt for 57 years at least. I absolutely LOVE reading your stories and I am grateful to have “found” you again! This was beautiful! I love those photo booth images. They remind me of Diane Arbus portraits. Your latest quilt is a beauty — and so is your story of friendship. 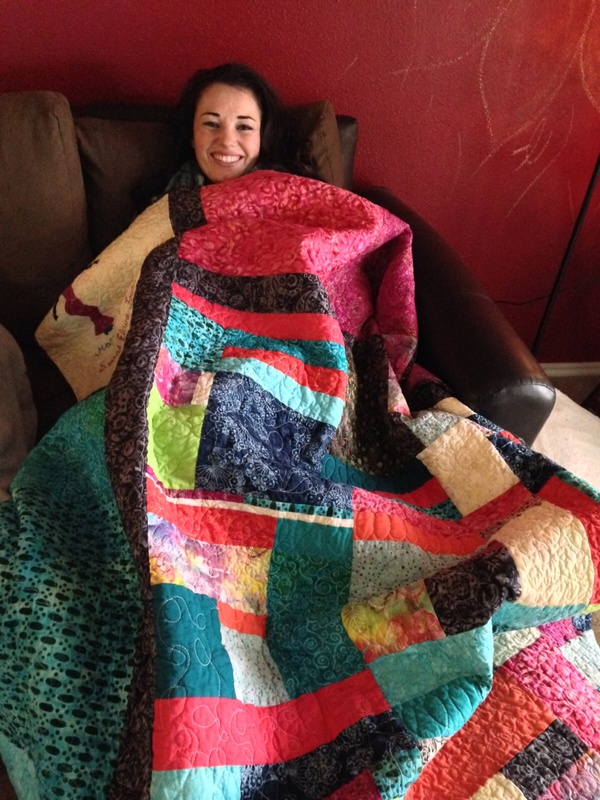 What a sweet, sweet story and a beautiful quilt!